Every 2 Minutes You Could Pay Full Price! Winning bidders are bidding around 32 to 35 thousand points to win their respective auctions. I have to wonder whether or not they realize that they’re spending pretty much the same amount to buy an Xbox one as they are to MAYBE win one here. Am I missing something? Is there some great inexpensive way to earn points? Assuming said inexpensive way does not exist then from where I’m sitting that’s 335 20 oz bottles of Mountain Dew (you get 100 points per 20 oz). That’s $502.50 (assuming they’re 1.50 a bottle). Again, I might be missing something here, but it seems like a lot of money to blow to MAYBE win an xbox one. But I guess if you’re spending the money on mountain dew and doritos anyway you’re not losing anything. Edit/addition: I've been searching for explanations as to how and why so many people have so many points to use. One unnamed person on some backwoods mountain dew forum went to 3 different grocery stores looking for sales on mountain dew and doritos. According to him he bought 100 2liters of mountain dew and 150 bags of doritos to get enough codes to win an xbox (over 40 thousand points apparently). It cost him "around 350 bucks" with tax. So, it's awesome that he can get about a 200 savings on a system, but holy crap! It's a ridiculous waste! It's not like he can then give those bottles or Dew or bags of doritos away. He had to have OPENED everything to get the codes to input. So this jackass just wasted close to 53 gallons of liquid and 187 lbs of food wasted. 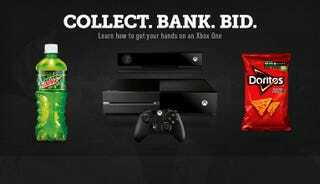 for an xbox. When 842 million people in the world do not have enough to eat. If you want an xbox then go buy an xbox. Don't waste food.